Sixteen-year-old singer-songwriter and viral video sensation Shawn Mendes launched his music career when he started posting covers on Vine. Less than a year after his first video, AG Artists’ Andrew Gertler discovered Mendes’ YouTube cover of the song “Say Something,” which led to the young singer signing with Island Records. 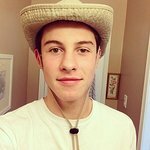 Mendes released his first single, “Life of the Party,” on June 26, 2014, and it became the number one song on iTunes in both the U.S. and Canada within one hour, selling over 100,000 copies in its first day. Shawn became the youngest artist to break the Top 25 on Billboard Hot 100 with his first chart entry. He won a Teen Choice Award as Choice Web Star in Music this year and was recently named a featured artist in Radio Disney’s “N.B.T.” (Next Big Thing) music showcase. After the immense success of his EP release, Shawn plans to head back into the studio to record a full-length debut album. Shawn just released his latest single, “Something Big,” in early November, and also recently announced that he will be touring with Taylor Swift in 2015. Google trends for "Shawn Mendes"
We don't have any videos related to Shawn Mendes.